The Ciutadella de Barcelona, or Barcelona Citadel, was a military fortress erected between 1716 and 1725 to control and repress the city's population, following the Bourbon victory over the Catalans in the Spanish War of Succession. Following numerous petitions, demolition started in 1869 and the land was earmarked for a large green area. 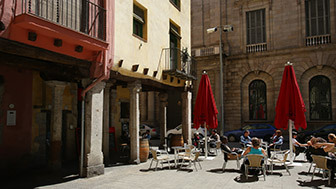 Parc de la Ciutadella was born. Ciutadella is one of the parks most admired by the locals. It occupies the land where the fortress and esplanade were built on the orders of Philip V following his victory over the Catalans in the War of Succession. Nearly one thousand houses were demolished here and in their place an imposing pentagonal construction was built, from where it was possible to control the whole city: it was the biggest military fortress in Europe. Today, the repressive symbol that Ciutadella represented has long gone, and in the park Barcelona residents of all ages mix with tourists from around the world. There are places to relax, walk, run, cycle, admire the many works of art that adorn it and appreciate the abundant vegetation, including trees planted in the 19th century. The park's current look is down to Josep Fontserè, who won the urban development competition in 1871 with his plans for a large, landscaped area with flowerbeds, trees and an artificial lake. In the years that followed, the park gradually took shape until the Universal Exposition of 1888 gave it a final boost. That was when the Cascade Fountain, greenhouse, bandstand and Castle of Three Dragons were built. Shortly after, a zoo was planned, which opened in 1892. All that remains of Philip V's fortress are a chapel, the Governor's Palace, (currently a school) and the arsenal, the seat of the Parliament of Catalonia since 1979. Other features were added at the start of the 20th century, such as the pond in front of the Parliament and the rather unusual stone mammoth. The equestrian statue of General Prim is also worthy of note, as is the figure crying in the centre of the pond: a copy of Josep Llimona's masterpiece Desconsol, or Despair. 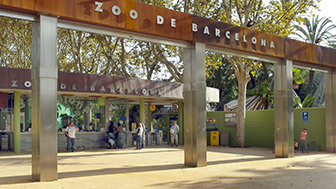 Barcelona Zoo is an iconic place for discovering animals from around the world.